With Ange Postecoglou becoming the new national team coach, my buddy Richard and I engaged in one of our regular email conversations about what his biggest challenges are going to be and what Socceroos fans should be expecting in the next few years from our new foreign coach. 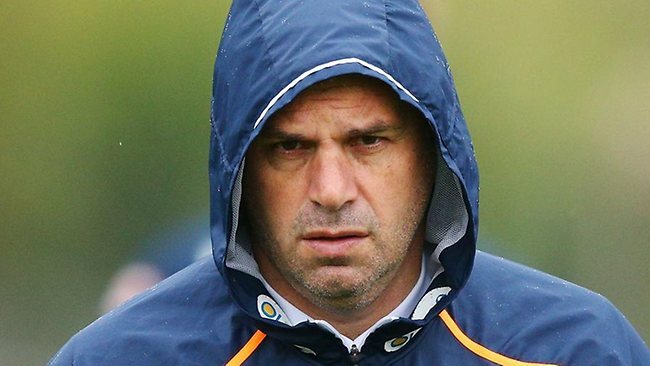 RICHARD: What are your thoughts on Postecoglou getting the job? ME: He’s definitely the guy to take over long term, and needs to have FULL control of everything and a big say in how our national youth teams are taught to play etc etc. But I do have concerns that his style of play is the type of thing that is taught over a length of time while working, day in, day out with players. If you have an ever changing squad and only a couple of days every other month to work with them, can you really implement anything? RICH: Yeah, it’s definitely worlds apart, isn’t it, club coaching and international coaching. Probably a large reason why guys like Ferguson and Wenger, despite all their their successes, have never stepped into the realm of international coaching. I like the idea of Postecoglou as well and agree that he needs full control of how the team (at multiple levels) is run, and needs to have the full confidence and backing of the FFA, through teething problems and all. Would be happy to see him wield the axe and blood some new talent. We really should have been ushering in a new school of talent after that 2011 Asian Cup. Guys like Rogic, Kruse and Ryan are clearly the future now. ME: Yeah, the reason I like it, is that he’s shown in the past that he is willing to drop or sack players that can’t fit his system. When he went to the Roar and just wiped out all of the Old Boys from Rangers etc and lost for a while he stayed confident in his plans and was proven right. He went to the Victory and let Hernandez go because he was lazy, and he was right. I have no doubt that ADP – as good as he is – would actually be struggling to start if Ange were in charge at Sydney. Doesn’t defend enough. I think we’ve definitely seen the last of Neill and some of the old guard. We’ll also see Mark Milligan be one of the first picked in every squad, because he understands how to play Ange’s style. RICH: Schwarzer would be on the chopping block as well. The way I see it, if he just wants to sit on the bench at Chelsea, he can deal with the consequences, particularly when Mat Ryan is starting for Bruges and getting plenty of game time. I see Milligan as being a major cog in the Postecoglou Socceroos as well. Like yourself, I’ll be the first to defend to the viability and importance of the A-League when it’s shat upon by Euroleague snobs, but I sense that Milligan playing his club football in Australia could be a setback (ever so minor) for him. I understand that playing in the A-League is just as good if not better than playing in second-tier European leagues, the Middle East and most of Asia, but I sense that if he’d been playing first team football for a decent enough European club for the past year or two, there’d be virtually no debate about him even being picked as new Socceroos captain. That being said, having played in Melbourne in the past two seasons (give or take) shouldn’t diminish his chances at the armband – he’s the right age, in career best form, has demonstrated immense leadership abilities since joining Victory and plays a really important role. ME: I think the biggest issue for him is that the only Australian player starting in the EPL (Mile Jedinak) also plays his exact same position. Additionally, he is the Captain of said EPL team, not just another cog in the machine, so unless we have 2 DM’s (which I doubt we will) then I don’t know how that is going to go. Schwarzer was out of the last squad and Langerak is playing Champions League football. I kind of thought he wasn’t going to start in Brazil anyway, but I don’t think he’ll even go now. I think that Bresciano may be the main older player that stays in the squad, and I wouldn’t be surprised if he was handed the armband for the World Cup. RICH: On Jedinak – see, that’s exactly what Milligan would have needed to make it a virtual lock for the Socceroos captaincy! I guess what makes it more ironic is that he was linked to Jedinak’s club in the off-season. Even if Milligan was in Belgium, France or The Netherlands, for instance, his captaincy stock would be way higher. Despite him turning out in Victory colours, I’m a big fan of how he’s playing. Just seems to have taken an enormous leap since he returned to Australia. Mate, if you ask me, Australia’s Brazil keepers will be Ryan and Langerak (their club form will dictate who gets first nod) and Galekovic as third choice (for similar reasons to Milligan – right age, career best form, great leadership abilities and respected by coach and teammates, etc). In light of that, Ryan playing in Europe and, as you point out, Langerak playing UCL football, I’d say Schwarzer’s done for. Agree that Cahill and Bresciano are the only ones from the old guard who would be worthy of their spots in the squad. Have also read that Bresciano will most likely get the captaincy for Brazil, but I imagine that his international career won’t go further than the 2015 Asian Cup, at which point, a medium-long term captain should be installed if not before that tournament. ME: I see what you’re saying with the European pedigree for Milligan, but I don’t think that’ll matter to Ange. That said, I don’t think Milligan will even be considered as captain to be honest, but I think he’ll definitely play a lot. I think we’ll get an older head such as Bresciano for Captain at the World Cup and POSSIBLY Asian Cup, and the long term captain will reveal himself in that period. RICH: Milligan will definitely get plenty of first team action under Ange, though if there will only be one DM, I assume Milligan would have to fall back into central defence (presumably replacing Neill if he’s axed) to make way for Jedinak? And yeah, a wait-and-see approach will definitely be most effective to anoint a new long-term captain based on how Australia fares over the next 12-18 months. ME: Well he already played the big games of qualification against Japan and the final match where we got through to Brazil. His opportunity came due to a niggle for Jedinak, but even Holger saw enough in him to keep him in the side once Jedinak recovered. So his current club coach, who thinks the world of him, and has kind of build his teams structure around him and made him the captain for this season? I think Jedinak may be the one that has to move positions…? Maybe as a stop gap defender, maybe a little further up the park? Depends on the formation. But that’s just it, Ange won’t have the luxury of bringing in foreign players that suit his style. He is limited in who he has at his disposal. If Australia doesn’t have the strikers that he needs (and he clearly doesn’t seem to think we do given his history of foreign forwards at club level) what does that mean for his game plan? He isn’t a single minded coach who only has one way to do things – he’s shown a willingness to change up his formations – but the same style is always there. Will be an interesting time, that’s for sure. RICH: We’ve been found wanting up front ever since Viduka faded into obscurity – even then, he never fully fired on all cylinders when he played for Australia. No one since then has really taken their chances – McDonald, Kennedy, Brosque, Thompson et al. We’ve obviously resorted to using him as a striker before, but the way Cahill is banging them in over in the MLS (12 goals in 37 games), I’d say he’s possibly our most experienced and reliable option up front? It’s funny because we’ve got some genuinely talented and creative players (Rogic and Kruse), some really good young keepers (Langerak and Ryan), some decent wide options albeit “fringe” players (Nicholls, Oar, Zullo) and some very reliable defensive midfielders (Milligan, Jedinak) but then there are gaping holes in our defence and the lack of any firepower up front. ME: At least we won’t lose the game in the middle of the park! The thing is, we actually have guys that are scoring goals for fun in European leagues right now (Matthew Leckie, Dario Vidosic, Robbie Kruse, Oliver Bozanic) but none of them are out and out strikers. They’re wide forwards, or Attacking Mid’s or at best you might call Leckie a “Second Striker” but no real out and out strikers. Now, Scott McDonald has never scored for Australia and may very well have a line through his name, but I think he’s probably the closest we have to a Berisha/Smeltz type to suit Ange’s style. I think a lot of these Socceroos that have been given assurances about playing in Petrol leagues and it not making a difference to their World Cup ambition will be pretty unhappy right now. RICH: Same, I don’t want to see Cahill used as a striker either but his goal-scoring, even if in the MLS, will be hard to ignore if he keeps it up. Ideally, I’d really like to see an instinctive finisher up front – someone who knows how to position himself and put the ball in the back of the net, in the mould of Smeltz/Berisha or, if we’re to use more glamorous examples, Van Nistelrooy, Klose, Shevchenko, Owen or Inzaghi (at the peak of their careers obviously). I think Scott McDonald’s opportunity has come and gone. Not playing in the UCL anymore won’t help either. With some friendlies slated for next month potentially against England and Ireland, I’ll actually be inclined to watch the match to see who’ll turn out for the Socceroos. ME: Yeah, I agree with the idea that his time has come and gone for the Socceroos, and he’s not playing at the top level, but he is still in the Championship – which is rated as highly as all the second tier European leagues. But the only reason I even bring him up, is because he’s the closest thing we’ve got to a pure finisher. His outstanding run of goals at Celtic was only a couple of years ago, and I’ll be surprised if Ange isn’t at least considering him. He has had the problem throughout his Socceroos career of being employed as a sole striker in a 4-5-1, which simply put is a terrible idea for a poacher who is 5’8” – so I don’t totally blame him for his national team duck. On the other had we have Josh Kennedy who is a good plan B, but under Ange, he is really not agile enough to play at striker. Outside of that, all of our strikers not playing in Asia are 22 or under and frankly, nowhere near ready. There is one final possibility though. The Great Uraguayan* Myth. Richard Porta. Maybe he can fit the bill. Only I don’t think anyone has actually seen him play. *I hope you know the correct way to pronounce that word – You-Rag-We-An. RICH: Yeah, I think McDonald was a victim of circumstance during the Pim years – tactics and formations worked against him and, as you say, being his size in a 4-5-1 is a pretty thankless job. He’s 30 years old now and even if he gets another chance, it really shouldn’t stop us from blooding someone (anyone!) for the long term as I can’t imagine McDonald being seriously considered for any tournaments beyond the 2015 Asian Cup. Where’s Rukavytsya these days? Smaller Bundesliga club or something? Great pace, but always thought his finishing and touch needed some work. ME: Yeah he’s bounced around Europe a little, without ever REALLY cracking a permanent first team spot. Had a decent run at Hertha Berlin playing 50 odd games over the space of a few seasons, but ultimately finished with 5 goals. If his finishing was a bit more clinical I’d be all for him having first crack up front in that general Ange system, but ultimately we are REALLY low on striking stocks and I think it’ll be his first big issue to deal with. The Defence is also an issue, but there are young players that could take up a strong role if given an opportunity, and up front we don’t have that luxury. I just realised, that this brings Archie Thompson back into frame. RICH: Yeah, I alluded to Thompson a few emails back when I was lamenting the lack of strikers in the post-Viduka era. He’s shown some solid form in the A-League over the past two seasons despite his advancing years, but whether this can readily and meaningfully be translated into the international arena is a completely different story. Ultimately, most competitive games Australia plays now will be against other AFC nations – obviously for qualifying campaigns, etc – but you have to ask whether he can cut the mustard at World Cup level when we’re going up against the likes of Argentina, Spain or seeded powerhouses like Belgium and Switzerland. ME: Well Ange needs Defenders that can pass, and I don’t really think anyone has asked any of our defenders to do that for quite a while, so I don’t really know! I could see him playing Zullo at LB. Then there’s some good defenders in the A-League that I won’t start to get into. But I suppose you can see my point. Plenty more options there than up front. RICH: Yeah, I suppose guys like Beauchamp and Spiranovic in the A-League are on the peripheral but are perfectly capable of making cases for themselves with some strong showings. Forgot all about Ognenovski – no nonsense coupled with strength and height. I’m a fan. Ultimately, I don’t think there is a team of Australians in the world that will make any impact whatsoever at this coming World Cup, and the Australian public needs to know that. We need to have the right expectations heading in so that there isn’t unnecessary pressure put on Ange to get us out of the group stage or anything. All we should really be wanting from the Socceroos in Brazil is that they show some pride in the jersey, at least look like they are trying to play some positive football, and don’t embarrass themselves. I’ve uttered what some might consider negative, but I maintain are realistic, remarks in the kitchen at work here regarding how Australia will fare in Brazil and people were saying that I wasn’t being fair on the team – part-time followers of the game who clearly know nothing. We’re kidding ourselves if we think we’re going there to do anything than make up the numbers unless a very, very kind first round draw is given to us and we play out of our skins. I think casual followers of the sport have this mindset of “We got out of the group stage in 2006, why can’t we do it again? !” without realising that that will soon be 8 years ago – a massive period in footballing terms – and the core of that squad is now either retired or just over the hill. As you say, it’s all about tempering public expectation. Ange must not be put to the sword if we don’t get out of the group stage – as I highlighted yesterday, he really needs the full backing, confidence and patience of the FFA as clearly what his appointment is aimed at is implementing a medium to long-term plan. And, yeah, Sasa made his international debut very late in the game, didn’t he? At 30-31 years old or something? Became a bit of a revelation after he won the ACL with his Korean club and was named AFC Player of the Year or something? ME: I would assume that Ange being the headstrong person that he is would have been very specific with his contract and what is expected of him. And yeah Sasa didn’t get his first cap til he was 31. So he may not be as burnt out. But the thing is, if you’re going into the a World Cup with Ogmonster as your senior, most experienced defender and leader at the back, you can’t really expect to win much of anything. RICH: Yeah, I’m really of that mindset that after the back to back 6-0 results, we really have reached the depths and there’s really nothing to lose from here such that I’d welcome some major experimentation from Ange. This will be Australia’s third consecutive World Cup, but if you look at the case of teams like South Korea and USA when they were in a similar situation back in the 1990s, they’d also qualified for consecutive editions of the tournament but were plain and clearly just whipping boys, but through gradual development, they’re no longer just glanced over as 3 easy points for first round opponents but are genuine contenders to get out of their group these days. We might have to have a lacklustre campaign in Brazil, but I think the experience gained by younger players, if they’re given the chance there, will be invaluable come 2018 and beyond. ME: The thing is, I want him to experiment in up-coming friendlies, try a few things out, take a look at some different players, get a camp together leading up to the World Cup and then select the strongest available squad – that suits what he wants to do – and take them to Brazil. If Lucas Neill and co somehow manage to be a part of that squad, then so be it. But I can guarantee that there will be several players in that same squad that will benefit from the experience and will then be in a better position for us to have a real go at the Asian Cup on home soil, along with some even fresher blood that may not be ready yet but will be by then. I just don’t think that we need to throw away this World Cup to do so. We’ve made three in a row now, and people are starting to act like the Uruguayan’s in thinking it’s our divine right to be there. If this ends up being our last World Cup for 8 to 12 years, would you still want us flushing it? RICH: Yeah, good point you make about the possibility of not qualifying for future world cups. While our most recent qualification campaign would hardly suggest it, I think we’ll continue to be one of the stronger teams in the AFC going into the future such that we’ll always have a reasonable chance of qualifying, but certainly it’s no grounds for assuming it as a given as more casual supporters tend to do in the post-2006 era. Only need to look at the epic fall from grace of teams like Hungary and Russia/Soviet Union who used to be powerhouses and are now second-tier nations at best. Also, alluding back to our conversation yesterday about the need for a Berisha/Smeltz-type finisher? Turns out that Smeltz is actually a dual Australian-NZ citizen and undoubtedly chose to put his hand up for NZ instead, assuming that in the Viduka era that he didn’t have a chance in hell of playing for the Socceroos. His international goal tally is actually quite healthy as well with 23 goals in 48 matches for the All Whites. He’d be a handy option now if he were still eligible for Australian selection! On Smeltz, there are a couple of factors that rule him out. The first is that he made his NZ debut before he gained Australian Citizenship, so even if we didn’t have Viduka he would have been ruled out. And secondly, people forget that before he returned to NZ to play for the Phoenix, he was considered an overwhelmingly average footballer. He was coming off a season at Halifax Town, who were playing non-league football, where he scored 2 goals in 31 games. Until he hit that rich vein of form that is carrying through to today, he would never have been considered for Australia regardless. He was considered for NZ though, because, well, who else were they going to pick? 1. Who will play up front? 2. Is he going to have enough time to implement any sort of style of football on these players? 3. What will the back 4 look like? 4. Does he throw the kids in for the World Cup to gain experience and go for the Asian Cup trophy, or does he go for the best possible result he can get at the World Cup (and are those things mutually exclusive)? Anything to add or change there? I guess the other talking point was who gets the captain’s armband under our new foreign coach (he was born in Athens)? ME: Yeah, forgot about the captain thing. Definitely at number 5 on the issue list for mine though. Might have to pick this up again in 12 months time to see how he handled each of those issues and give him a mark out of ten for each…?